One of the things that we most love about Yarndale is the way that it brings so many people together to celebrate a shared love of yarn and creativity. The community spirit that exists within the yarn-loving world is amazing, and lucky us, we get to experience this every year through our famous Creative Community projects. This year was no exception, and our woolly sheep project certainly captured the interest and imagination of hundreds of makers all over the world. We launched our Creative Community project at the end of June (you can read about it on our blog here), with free knitting and crochet patterns available to anyone who fancied digging out some scraps of yarn and making a sheep to send on a journey to Yorkshire. Within a matter of days, the first little sheep began arriving, and the flock grew very fast over the weeks leading up to Yarndale. It was absolutely wonderful to see so many beautiful, well-dressed little sheep, the creativity and individuality was amazing! Sheep arrived from all four corners of the globe, many of them came with names and stories attached, all of them flocking together waiting for their chance to be a part of Yarndale. By the time the Yarndale weekend came, we had received just over 700 sheep (some joined the flock right at the very last minute, so we didn’t manage to get an exact count). They travelled from 32 different countries around the world. We managed to borrow eight big straw bales from a local farmer to keep our sheep snug and warm at the Auction Mart, and they looked so, so good all together…..so much glorious colour, pattern and quirky character! Visitors to Yarndale were bowled over by the woolly flock and donations were gifted in exchange for a sheep to take home. We are thrilled to report that every single one of the sheep went off to a new home, how wonderful is that? Our chosen charity was Martin House Children’s Hospice, a local Yorkshire based charity who provide family-led care and support to children and young people with life-limiting illnesses. This is a much loved organisation who rely heavily on fund raising and donations to keep going. The Yarndale Woolly Sheep project raised a heart warming £3103.01 for Martin House, what a terrific success!! Many, many thanks to everyone who made a sheep or donated money, it is very, very much appreciated. For those of you who re-homed a woolly sheep (thank you! ), you can lift up the little woolly jumper and hopefully find a small sticker with a number – this will tell you who created your sheep and where in the world it travelled from. With huge thanks from all of the Yarndale team, and the volunteers of Martin House Hospice. Your generosity and kindness is hugely appreciated. What a rich mix of countries the sheep came from! Well I took 179 and 350 back to New Zealand, so thank you to K and Marye, a super idea, also thank you to Yarndale a brilliant idea. 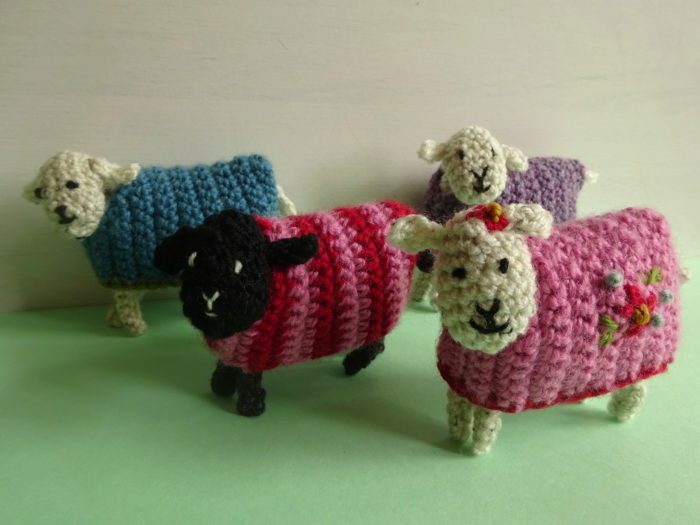 I think it is marvellous to read that people from all over the world made and sent these gorgeous sheep to Yarndale. Sadly I was not physically able to get there and buy some. How I wish I could. Congratulations to and admiration of all who made them. I was so disappointed this year! The programme said there would be a sale of the little sheep on Sunday at 12 o’clock. I didn’t even get to see them – they’d ALL been sold on the Saturday. Where was the display? I was told that there would at least be photos of them here but still have not been able to find them! Little Bo Peep lost her sheep and so did Yarndale!